Ash is back and heading to the UK this week, thanks to Virgin Media. The cult TV show that's been getting groovy reviews in the US finally heads to UK screens this week and there are five episodes ready to devour right now. That's because Virgin Media has put Ash Vs Evil Dead out on on demand, rather than any of its channels. This means you can catch up with where the US are, then continue to watch the show weekly in time with how it's scheduled in the US. 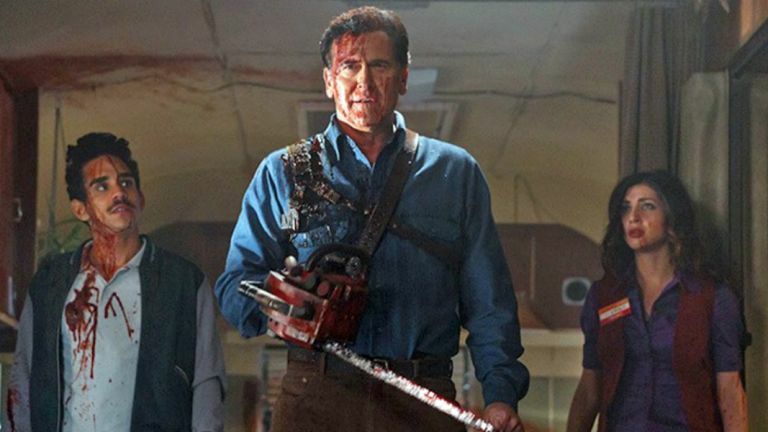 Ash Vs Evil Dead follows the exploits of Bruce Campbell's titular character. 30 years on from the Evil Dead movies, the show shows that Ash hasn't really been doing much. But it is down to him to make sure the Deadites don't end up taking over the world. Ash vs Evil Dead will be available from 1 December for Virgin Media TV customers to watch through its TV on-demand service. The good news is that is is free and available to everyone that has Virgin's More TV and above package and it will be available in gloriously gory HD to TV XL subscribers.